The intake air temperature (iat) sensor, mounted on the mass air flow (maf) sensor, monitors the intake air temperature. The iat sensor has a thermistor that varies its resistance depending on the temperature of the intake air. 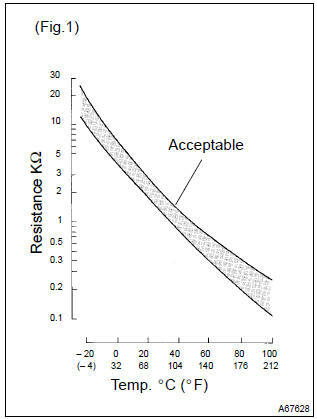 When the air temperature is low, the resistance in the thermistor increases. When the temperature is high, the resistance drops. The variations in resistance are reflected as voltage changes to the ecm terminal. The intake air temperature sensor is connected to the ecm. The 5 v power source voltage in the ecm is applied to the intake air temperature sensor from terminal tha (thar) via resistor r.
That is, the resistor r and the intake air temperature sensor are connected in series. When the resistance value of the intake air temperature sensor changes in accordance with changes in the intake air temperature, the potential at terminal tha (thar) also changes. Based on this signal, the ecm increases the fuel injection volume to improve the drive ability during cold engine operation. : after confirming dtc p0110, p0112 or p0113, confirm the intake air temperature in the ”diagnosis / enhanced obd ii / data list / all” using the hand–held tester or the obd ii scan tool. The ecm monitors the sensor voltage and uses this value to calculate the intake air temperature. When the sensor output voltage deviates from the normal operating range, the ecm interprets this as a fault in the iat sensor and sets a dtc. Example: when the sensor voltage output equal to –40 c (–40 °F) or more than 140 c (284 °F).